Below is a translation of a recent article by Michael Stürzenberger in PI-News on the great political dichotomy of modern times: left-wing (socialism, caring, good, progressive) compared with right-wing (Nazi, heartless, bad, regressive). In Germany in recent years the shouts of 'right-wing' have become much shriller. 'Right-wing' soon becomes 'far-right', which then turns into 'extreme right' or that new coining, 'alt-right', finally ending up as' Nazi' or its synonym, 'brown'. As far as the British media are concerned the German party Alternative für Deutschland is routinely styled in most mainstream news outlets as the 'far-right AfD'. The AfD responds with the argument that the core of their policies would have been considered to be 'centrist' not all that long ago. The terms used by its opponents in Germany make 'far-right' seem mild, however. Right-wingers are not and never were very good at propaganda. It is the left-wing that makes the running in name-calling. Occasionally some right-winger will squeak in self-defence that it is a bit rich for socialists to call right-wingers Nazis, since the Nazis were, in fact socialists – the clue being in the name: 'National Socialist'. Stürzenberger's article adds some depth to the thesis that the Nazi ideological building rests on socialist bedrock and is constructed with socialist stone. The starting point of the article is a video, in German, by the author and journalist Henryk M. Broder on the subject. Anyone who has read even only a few National Socialist tracts will have been impressed with the depth of the party's obsession with its two great hate figures: the Jews and the Bolsheviks. As far as the attack on Bolshevism was concerned this was very much a case of the pot calling the kettle black, one of those bitter internecine feuds between organizations that are to all intents and purposes the same as far as the outside observer can tell. The derangement was cleverly parodied in the 'People's Front of Judea' sketch in the Monty Python film The Life of Brian. Broder: Were National Socialists not left-wing extremists? The seemingly totalitarian left-wing mindset has become mainstream nowadays and has developed into a full-blown speech-fascism. It leads to Broder's consideration of questions that are not new but which were discussed energetically in the 70s and 80s among historians and politicians: were the National Socialists really 'right-wing extremists'? Are socialists not just left-wing extremists? This question really needs to be discussed nowadays, times in which 100 million EUR are pumped annually into the 'fight against the right' and regularly misused in order to combat conservative democratic patriots – on the street, in businesses, schools, universities, Parliament and even the churches. In accord with the idea of the NSDAP we are the German left-wing. We hate nothing more than the right-wing national property-owning classes. We are antisemites, because we are socialists. We will smash the bourgeois class-state. Inflation. Wild times. The dollar climbs like an acrobat. I feel quiet pleasure. Yes, chaos must come, if things are going to get better. Communism. Jewry. I am a German communist. To be a socialist means that I subordinate the 'you', that I sacrifice the individual for the general good. Socialism is in its deepest sense service. Abstention for the individual and challenge for the totality. We are socialists, we are enemies of today's capitalistic economic order for the exploitation of the economically weak, with their unfair wages, with its valuation of a human according to riches and property instead of responsibility and achievement. We are all determined to destroy this system at all costs. The hammer will once again become the symbol of the German worker and the sickle the symbol of the German farmer. We have liquidated the left-wing class-warriors, but unfortunately we have forgotten to strike towards the right. That is our greatest sin of omission. I learned a lot from Marxism. These new techniques of political struggle essentially go back to the Marxists. I only needed to take over and develop these techniques to have in essence what we desperately needed. We must recognise the socialist element in National Socialism in the minds of its followers. My political feelings leaned towards the left, the socialist at least as strongly as the National Socialist. The whole chatter about it, that there was, as it were, a serious radical right-wing threat… I ask you: were the Nazis right-wingers? I consider that a basic error, from you also. The Nazis were not right-wing, the Nazis were a left-wing party! The Nazi regime corrupted the Germans – with social benefits; with advancement opportunities for the small man; with a taxation system that, because of its repositioning upwards, was thought to be just; with enrichment opportunities from foreign property; with the licence to plunder; with the hope of victory and thus the annulment of all debts. The many borrowings of National Socialism from left-wing socialist thought are clearly present in the biographies of the participants. In the final phase of the Weimar Republic not a few of the later National Socialist activists gained communist-socialist experience. Was Adolf Hitler a left-winger? There are may good reasons to think that National Socialism belongs to the left rather than the right wing. In any case, during the time of its existence it had more in common with the totalitarianism of Stalin than the Fascism of Mussolini. We will not stay silent in this controversy, because in the end, National Socialism was also a variant of socialism, and its great inertial mass did not come from the flotsam and jetsam of the First World War, from the volunteer units, from the impoverished middle classes or from the bourgeoisie. Its inertial mass came from the millions of socialist voters who deserted the SPD at that time. I began this discussion. The public astonishment when Franz Josef Strauß in Essen called these left-wing anarchists the best pupils of Himmler was the starting point. 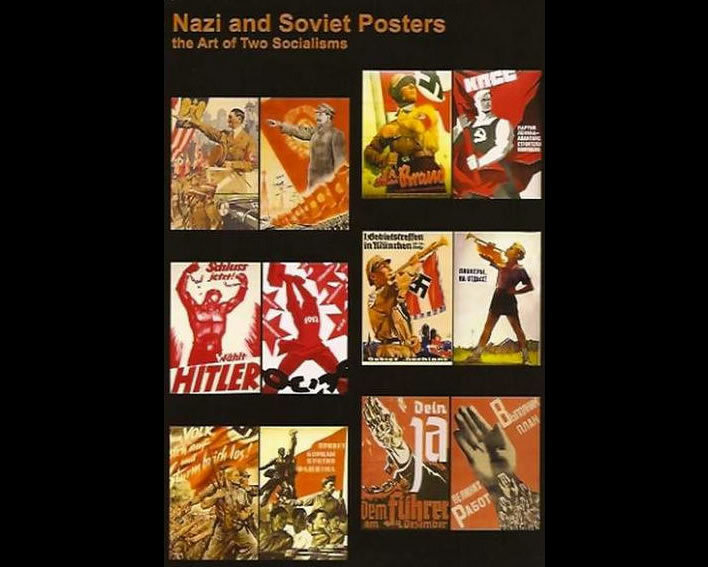 It is a highly interesting matter to expose the shared roots between Communism and National Socialism. The outlines are fluid and National Socialists were in essence socialists. Many socialist characteristics can be found among the Nazis. The Jusos (Young Socialists) and the Judos (Young Democrats) are criminal figures, for they pick up with obvious learning capability and rapid apprehension the methods of the SS and the SA and the other National Socialists before the seizure of power in 1933. 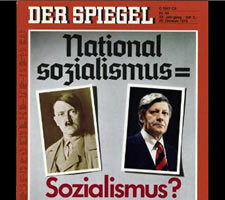 National Socialists were also (and above all) socialists. The NAZIS were a left-wing party. Forgotten? 'Right' means conservative, conscious of values, democratic, patriotic, law-abiding, constitutional and non-violent. The right believes in individualism and rejects enforced conformity of collectivism. The escalation 'extreme right-wing' can never be socialist. The term 'right' is being demonised using the despicable 'fight against the right'. The right has to be unconditionally legitimated again as an absolutely justified and legitimate political movement. Common ground between National Socialists and International Socialists can be observed today. The inherent differences lead than as now to violent confrontations, which can be regarded to some extent as fraternal war. National Socialism can therefore be seen as a variant of left-wing extremism.